Gain reduction meter – the gain reduction meter displays how much compression is being applied at any moment by showing a negative value in decibels i.e. -1dB /-3dB / -5dB. The more lights that illuminate the more compression that is being applied. Output meter – Displays the signal level at the output of the compressor. This is often simply called “level” and is switchable between the compressors input and output level. Peak/RMS detection – This switch controls the detector circuitry in the compressor, it will either respond to a peak value in a signal or an electronically averaged version of the signal. RMS detection is often more transparent sounding than peak detection. Hard knee/Soft knee – This is a switch which changes the envelope of the compressors action. A hard knee means the full ratio is applied when the threshold is exceed and a soft knee means this ratio is applied in a more progressive manner. The term “knee” is derived because a soft knee response graph has a gentle bend and a hard knee has a sharp bend. Soft knee compression tends to sound more transparent and smoother. Auto – This switch will insert a circuit that will apply automated release (and/or attack) times often based on and adjusted dependent on the programme materials transient content. Feed forward and feed back compression – This is not so common but an audio compressor has a detector which can be placed in 2 different places in the circuit. This circuit detects the relationship between the signal level and the threshold. A Feed forward circuit simply detects the signal at the input of the compressor but a feedback design detects the signal after gain reduction at the output. Compressors can have various types of gain reduction element which offer different sound characters, this will be discussed briefly. Some common types are VCA (voltage controlled amplifier), Optical (LED), FET (Field effect transistor), Vari-Mu (remote shut off valve/tube). In addition, the supporting electronic circuitry can have a bearing on the sound. Examples include valve or solid state make up gain stages, whether it has audio transformers in the input and output stage and whether the topology of the circuit is Class A, Class B or Class AB. Every compressor sounds a little different to each other and this can cause further confusion to those learning to use a compressor as each has a slightly different sound quality. However do not be disconcerted as this becomes useful as you become more experienced. So you have heard about compression and everyone and his dog are using them and you want to get in on the action and find out what you are missing. Well yes it is a very useful tool but often best applied with a goal in mind. So we know it can even out sound levels and we also know it can change the tone of an instrument by adjusting the peak to average ratio in a sound. That can take some time to hear and so first we must play with some extreme settings so we can have some practical experience. We will focus on a plugin compressor which everyone should be able to find in a DAW. I would select the following 2 sources in order to experiment with learning a compressor. 1) A drum pattern that includes a kick, snare and hi hat. These 2 sources are great because we can more easily hear what a compressor does on these sources in particular. The human ear is good at determining changes in the sound of human voices and the drum pattern is rich in transients (peaks) which compressors react to. When practicing compression I suggest the following setting initially…. Immediately you should be able to hear that the level of the source lowers as compression takes place you should see the gain reduction meter applying some compression. As you lower the threshold the source will become quieter so you can apply some make up gain. Apply roughly the same amount as the gain reduction that is taking place. 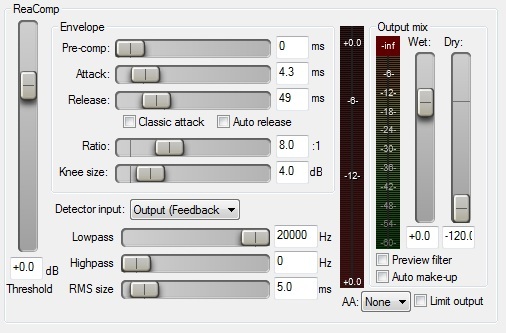 This should bring the level to around what you heard before your started compressing. Then you can switch in the bypass control on the plug in and compare the unprocessed sound with the processed sound. Also try adjusting the attack and release controls, you will hear changes in the sound as these are varied. Some words that spring to mind that describe fairly extreme compressor behavior are “blatty”, “stuttery”, “nervous”, “pumping”, “thick”, “non rhythmical” and “rhythmically sympathetic” At first it can be a lot to take in and the question of why you would want to do this may occur. Remember these are extreme settings in order to attune the ear to the changes compression can apply. In actual practice in a music mix it is common to have less extreme settings which are less obvious but create a subjectively enhancing change to the sound. The crux of the matter is that when you use a compressor it is always best to have a goal in mind. Do you want to even out the drum hits? Or even out the loud and soft sections in a vocal recording? Or maybe you want to tonally alter the sound of an instrument by using compression to give it a certain character? At first I suggest practicing ear to hand co-ordination and just play, this will slowly get your ear used to the variety of sounds that a compressor is capable of. It may not initially be obvious as to what use the actual change in sound might be. This is why I have suggested quite extreme settings. However it usually takes some months and often years to fully appreciate and be able to confidently control compressors in meaningful ways. This will often be a slightly frustrating process and yet one day it will nicely fall into place and you will organically understand both how to control a compressor and use it effectively to obtain a required goal. Practice makes perfect. Nice overview, I always like well written articles about compression because it’s one of those things that always seems a little mysterious to me no matter how much I read about it and use it. I’d love to see some more in-depth descriptions about the different types, such as LED etc.